Peter Jameson admitted Blyth Spartans cannot keep making mistakes or they will get punished following a 3-1 defeat at Alfreton Town. Two goals in as many second-half minutes from Tom Denton and Tom Platt quickly put the game out of reach for Alun Armstrong’s men, who had gone into half-time level after Robbie Dale equalised from the penalty spot to cancel out Denton’s earlier opener. Moments before Denton struck to restore the home side’s lead, Blyth should have gone 2-1 up as Dan Maguire witnessed his effort hit the post from inside the area. Another factor was the injury to Aaron Cunningham in the 53rd minute. With Nathan Buddle now the only fit centre-half at the club, Blyth lost the attacking threat of Sean Reid as he dropped into the heart of the defence. But whilst Jameson conceded that Maguire’s chance and Cunningham’s injury had a negative impact, he said Blyth need to start rectifying their mistakes. Jameson said: “It was a poor start going 1-0 down then I thought the lads did really well, we got ourselves back into it. The majority of the first-half, I thought we were the much better team but in second-half, that changed. “We were told in the dressing room at half-time – their out ball was to the big lad up top [Denton] so we had to try and continue to stop that but also focus more on ourselves. “I honestly thought we’d come out in the second-half and really kick on but we give away two mistakes which resulted in two goals for them. “Nipa’s chance – it knocked the wind out us really then Aaron going off – it kind of deflated us a bit but we can’t make mistakes like that. As you’ve seen, we will get punished for them. Despite defeat, Jameson did come out of the game with some well-deserved credit. In the first-half, he plucked Denton’s 38th-minute header, that looked destined for the bottom corner, away before denying the 6ft7 striker again – somehow tipping the backspin ball over the crossbar whilst off balance. Perhaps it was one game too much for the Spartans defence, who had to contend with two tall and physical strikers for the second time in four days. 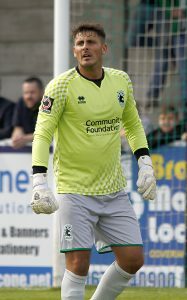 Having battled superbly against Darlington’s Simon Ainge and Reece Styche, Blyth failed to stop Denton and former Gateshead player Richard Peniket from dictating the play in the second-half. “It’s very difficult for the defence to deal with the big lads because they’re just a nuisance,” said Jameson. “But overall in the first 45 minutes, I thought we dealt with them really well. But then Aaron has gone off and kind of changed the game.